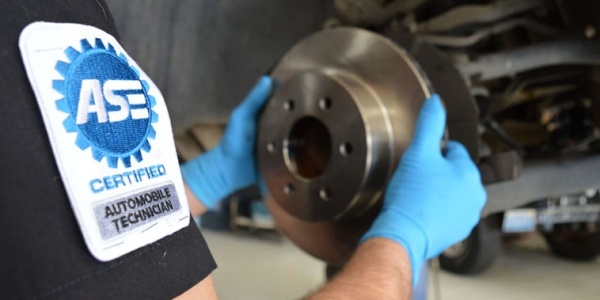 Every car owner knows brake repair is one of the most repeated car maintenance and safety issues there is. At Lowry Repair Center we offer the most comprehensive services, with top of the line brake parts at reasonable prices. We take pride in making every brake repair in the up most quality as possible. We offer on the spot diagnosis to make it right the first time. We will try our best to get you in and out in a timely manner. There is a lot that goes into the brake systems on today’s vehicles. The system mostly works off of hydraulic fluid that gets dispersed throughout the system every time your brake pedal is depressed. When the brake pedal is depressed hydraulic fluid moves through the brake lines to all four wheels, then the fluid goes through the brake calipers/ wheel cylinders which in turn pushes on the brake pads/shoes, the friction by the brake pads and rotors makes the vehicle come to a stop. On some vehicle applications there is antilock brake system (ABS) and traction control (TC) systems that works with the brakes to have better control and stopping on slippery and wet driving conditions. The ABS is electronically controlled by the ABS module which works with the wheel speed sensors to see if the car is sliding or not. The TC works with the ABS on acceleration to limit spinning out. It takes the wheel that is spinning out and applies brake pressure to slow the wheel down to gain more traction. Schedule an appointment today! Give us a call for more info! Monday–Friday 7:30 a.m.– 5:30 p.m.